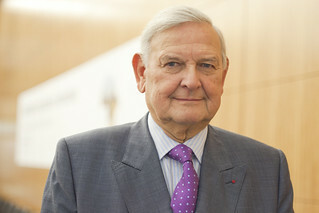 François-Xavier de Donnea served as the Belgian Secretary of State for Development Co-operation from June 1983 to November 1985, and as Minister of National Defence from November 1985 to May 1988. He was Mayor of Brussels from 1995 to 2000. Member of Parliament from 1981 to 2014, Mr de Donnea is also Professor Emeritus at the Catholic University of Louvain where he was in charge of the Centre for Research in Public Management of the Institute of Administration and Management. Mr de Donnea has been since 1998 Belgian Minister of State ( Member of the Crown Council). He has been President of the Sahel and West Africa Club since 2009 and played a key role in the creation of the new Club. His work for the Club has focused notably on engaging new development actors, strengthening South-South co-operation and increasing the participation of Parliamentarians from OECD Member countries and West African States. He holds a PhD in economics from Erasmus University Rotterdam and an MBA from UC Berkeley. As of January 2019, Dr Ibrahim Assane Mayaki, current CEO of NEPAD, will become SWAC President.